Top 10 Guitar Pedals for your Christmas Wishlist! - Andertons Music Co.
Top 10 Guitar Pedals for your Christmas Wishlist! 2018 saw the release of many incredible pedals. In fact, there were so many cool stompboxes launched - we struggled to even compile this list! With dozens of companies constantly innovating and pushing the boundaries of pedal design, the bar seems to be raised year-after-year. Throughout 2018, there were lots of fresh and inspiring stompboxes that certainly peaked our interest. For Christmas this year, we believe that our ‘best of 2018’ list will help you to decide which pedal you’d like Santa to bring. There’s tons of variety, so we’re sure you’ll find something inspiring to add some Christmas glow to your pedalboard! Gamechanger’s renowned reputation for innovation was evident when they launched the eye-catching Plasma distortion pedal at the Winter NAMM Show. Transforming your guitar signal into a series of high-voltage discharges that pass through a xenon-filled tube, this pedal sounds just about as crazy as it looks! Gamechanger Plasma on Andertons T.V. Robert Keeley is a true trendsetter in the pedal industry. His ethos for building functional effects that any guitarist can use has made his brand one of the most respected out there. The Caverns V2 is certainly one of those; a 2-in-1 delay and reverb pedal that will cater for all of your ambient needs. With an updated design, the V2 gives you more tonal options than its predecessor. Boasting 3 reverb modes, this versatile pedal provides you with anything from a traditional ‘spring’ reverb sound to more experimental textures like ‘shimmer’. With the ability to mix the wet sound with your dry signal, you can also influence the decay of the reverb too for short or long trails. The delay side is almost equally as diverse. Based on Keeley’s own Magnetic Echo delay pedal, the Caverns V2 emulates that classic and desirable tape-style delay sound. Featuring ‘deep’ and ‘light’ modes, you can attain a strong repeat or a more subtle delay that can thicken lead lines beautifully. Just place this unit at the end of your pedal chain, and bask in the ambient bliss! You may be thinking ‘oh great, another overdrive pedal that the world doesn’t need’. Well, while we agree that there are way too many dime a dozen overdrive pedals out there, the JHS Bonsai certainly isn’t one of them. That’s because this powerful little stompbox provides you with 9 legendary Tube Screamer sounds, all from just a single and compact unit. If you’re a player that just can’t get enough of that famous green overdrive tone, this homage of sorts captures the sounds of some of the most renowned and popular TS models from over the years. If you’re a tonal purist, you’ll be pleased to know that this pedal doesn’t employ any digital modelling technology whatsoever, but relies on pure analogue circuitry like the originals. And if you’re worried about the emulations not sounding that genuine, you’ll find that they’re incredibly accurate! JHS 'The Bonsai' on Andertons T.V. Landlord FX are newcomers to the large and competitive world of stompboxes, but they’re already making a statement with their mini pedal range. Okay, so we know that these count as more than one, but their lineup is so affordable that we just couldn’t resist adding them to our list! With the tiniest of enclosures, you can easily find a vacant space on your board for one of these petite pedals - or more! With dirt pedals, modulations and time-based effects like reverb and delay available, Landlord has catered for just about every player. Oh, their pedals are true bypass too! Landlord Pedals on Andertons T.V. In 2018, Andertons TV’s very own Peter ‘Danish Pete’ Honore collaborated with British company ThorpyFX, creating a signature overdrive and boost pedal entitled ‘The Dane’. Finished in a stunning chrome and purple colour scheme, this pedal is also in a smaller enclosure than ThorpyFX’s other dual pedals. This allows you to easily mount the unit to your pedalboard, especially with the ergonomic top-mounted jacks. In terms of how it sounds, the overdrive circuit has a responsive and high-headroom quality that excels for styles such as blues. Reacting beautifully to the placement of your guitar’s volume pot and your picking attack too, this pedal lets you play with loads of expression. The boost side is super-fat and warm, providing creamy lead tones and long-lasting sustain when used in conjunction with the overdrive circuit. Right, so the BOSS RC-3 isn't a new pedal at all. In fact, it was released all the way back in 2011! However, if you're looking for a fun pedal this Christmas that inspires creativity, you can't really beat a decent looper pedal. And that's exactly what the RC-3 is. Essentially the industry standard when it comes to loop stompboxes, the RC-3 is enclosed within the ubiquitous and near-bulletproof BOSS chassis, and has a number of useful features that'll satisfy any guitar player. With a whopping 3 hours of looping time, this compact unit has many of the best features from the flagship RC-30 squeezed into its design. With 99 storable loops and USB connectivity for exporting ideas to your computer, there are almost no limits to this powerful pedal! BOSS RC-3 on Andertons T.V. Following in the footsteps of Misha Mansoor, Tosin Abasi has also taken a step into stompbox land and released a drive pedal under his Abasi Concepts brand. Named the Pathos, Abasi turned to Brian Wampler (of Wampler Pedals) to co-design a cutting-edge distortion pedal that, ultimately, turned many heads in the guitar community. Dishing out crushing dirt tones with an amp-like response and feel, this pedal is high-gain heaven for modern metallers. Capturing that recognisable American high-gain sound, the Pathos pedal boasts a full 3-band EQ section for fine tonal tweaking. However, it’s the Pathos' voicing toggle switch that sets it apart from similar pedals on the market. Adjusting the gain and feel to varying levels of intensity, this unit is perfect for heavy riffs and searing solos! The trend of amplifier brands moving into the pedal game continued in 2018, with Victory also making its first foray into the market. Releasing three powerful preamp pedals based on their most popular amp heads, you can get Victory tones through almost any amplifier! Employing four genuine valves, this fully-analogue design offers you the filthy yet focused high-gain tones that the Kraken amplifier is praised for. Boasting two channels and multiple controls for flexible tone-shaping, this potent pedal can become the centrepiece of your guitar rig. The V4 Kraken pedal can be used in two distinctive ways, letting you integrate it into your rig in the best way. It can be setup like a traditional pedal, where you can simply plug it straight into the front of your existing amp. However, unlock its full potential by routing it through your amp’s effects loop. Letting you enjoy your amp’s tones with the pedal disengaged, you can bypass your amp’s preamp section with it switched on, giving you an entirely new voice! Victory V4 Preamp Pedals on Andertons T.V. Released a couple of years ago, the Line 6 Helix was an absolute game-changer in the world of pedals. Line 6 expanded their Helix range with the streamlined LT version and the HX Effects pedal in 2017, and in 2018 we saw the release of the HX Stomp. Essentially the full-fat version of the Helix packed into a tiny enclosure, this little box of wonders does just about everything! Boasting the exact same amp modelling technology as the flagship Helix, multiple built-in cabinet IRs, over 300 Helix and legacy effects, USB connectivity, MIDI ports and stereo outputs, there’s almost an endless amount of ways to integrate this potent pedal into your existing rig. With the ability to use up to 6 simultaneous amp, cabinet and effects blocks, you can experiment to your heart’s content. So, if you’re someone looking to have the most portable guitar rig possible, we can’t think of anything more powerful that this! Line Helix HX Stomp on Andertons T.V. Orange are an established brand in the world of amplifiers, but over the last few years it has dipped its toes into the pedal market. Demonstrating that they are keen to innovate, 2018 saw the unveiling of the OMEC Teleport, a high-quality USB interface built within a mini pedal enclosure. Featuring high-quality AD/DA converters for studio-quality audio, this tiny stompbox boasts real pedal and amp impedance to treat your rig's signal as analogue, ensuring that your playing dynamics remain intact when recording. Also sporting stereo outputs, the Orange OMEC Teleport can unleash the full capabilities of the stereo-enabled pedals on your board. That’s not all though, as the device comes with a free copy of Amplitube CS software too; one of the leading amp and effects simulators for iOS and Android devices. This lets you track directly to your phone or tablet! 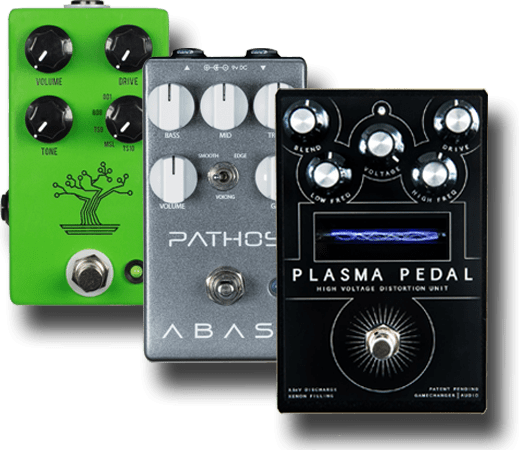 With so many great pedals released in recent memory, and a nearly countless amount available on the market today, we thought we'd extend this article and share our honourable mentions too! We've already given Keeley a shout out with their Caverns pedal, but over the last couple of years the company has launched a number of other stompboxes that are just as excellent. The El Rey Dorado Overdrive pedal is one of the most noteworthy, essentially a classic Marshall Plexi in-a-box. Boasting a tone control alongside its conventional drive and level knobs, this pedal also sports a mode switch that goes from a cranked black and gold sound to filthy high-gain onslaught! The D&M Drive is the signature pedal of Dan Steinhardt and Mick Taylor from That Pedal Show; a 2-in-1 overdrive. While Mick's side offers that infamous green boost tone with some of Keeley's own Katana pedal thrown in, Dan's side delivers a sizzling drive sound that has tonnes of mid-range bark. The Keeley Compressor Plus is the latest in Keeley's compact compressor line, released in 2017. Building on the foundations of the their legendary 4-Knob compressor, the Plus boasts a blend knob that lets you mix your dry signal with the compression, meaning that you can attain subtler sounds if you wish. The Keeley Aria Compressor/Overdrive is a slightly different affair, however. Split into two sides like the D&M Drive, with this stompbox you have two essential effects within a single enclosure. Keeley El Rey Dorado on Andertons T.V. Xotic Effects are simply adored by our customers, and at the moment you can save up to £113 on four of the their top models in our Epic Deal! Known for their glorious drive circuits, the BB Preamp pedals dish out authentic amp-like tones, with either 'Mid Boost' or 'Compression Mode' versions available. The AC Plus Booster is one of the most sophisticated boost stompboxes we've ever seen, boasting two channels and a range of controls and switches, giving you complete authority over your tone. Xotic Pedals on Andertons T.V. Tone City pedals have been among our best-selling products for a few years, and there's a good reason for that. Much like their Landlord contemporaries in terms of their pedal sizes and affordability, Tone City boasts a bigger range that includes almost every effect type under the sun! Tone City Pedals on Andertons T.V. Click here to shop all pedals!